In mid-March, after almost 16 years, I finally returned to Moscow with A (who was on a business trip). When I left Russia in 1997, after living there for three years, I didn’t know it would take me that long to go back. In the last decade and a half, Moscow has certainly gone through many changes – most of them good. We arrived on a beautiful sunny spring day at the luxurious Ararat Park Hyatt right smack in the middle of town – a few blocks away from the Kremlin, GUM and Red square, walking distance to the pedestrian streets of the center now filled with restaurants and shops, half a block away from the recently renovated Bolshoi and across the street from the Maly theater which is still under renovation. In the week we were there, we walked to nearby restaurants and also to explore. In my opinion, the Park Hyatt probably has the best location in the city for sightseeing and exploring on foot. The renovated rooms, redone by Tony Chi at the Park Hyatt Moscow, are modern and luxurious with illy espresso machines, Blaise Mautin amenities, separate rain shower and bath and a spotlit Murano glass bear sculpture by local artist Andrey Frangulyan. Our room had a large picture window overlooking the renovated TSUM, the Central Department Store (and what used to be the little sister to GUM, the State Department Store, on Red square). We also had a view into the dance studios of theater school next door where we watched dancers going through their routine nightly. My only gripe about the room was that with all the dramatic lighting, it was quite dark and difficult to read but I suppose that with dim moody lighting, everyone and everything looks good. 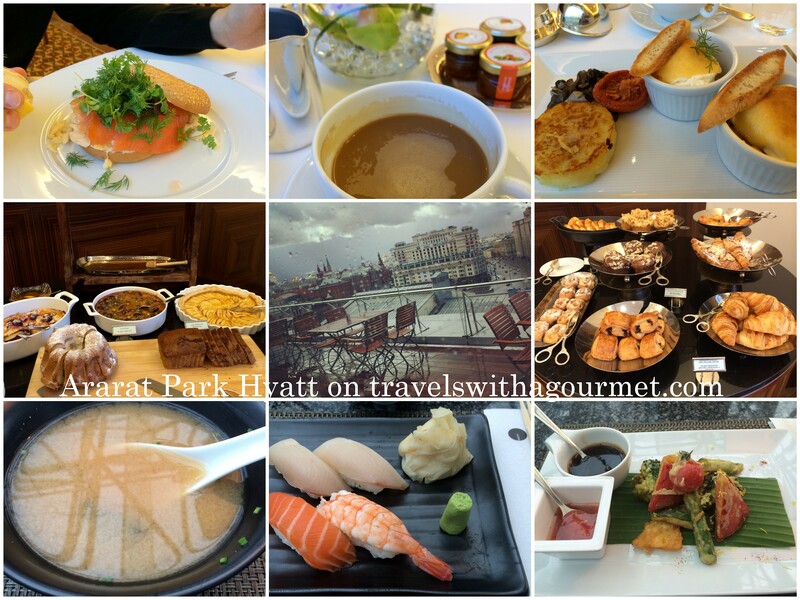 Breakfast was a wonderful spread at the very quiet The Park restaurant on the second floor. I also had the chance to enjoy a solo sushi lunch at the top floor Conservatory Lounge on one of the snowy days, of which we had several during the week. 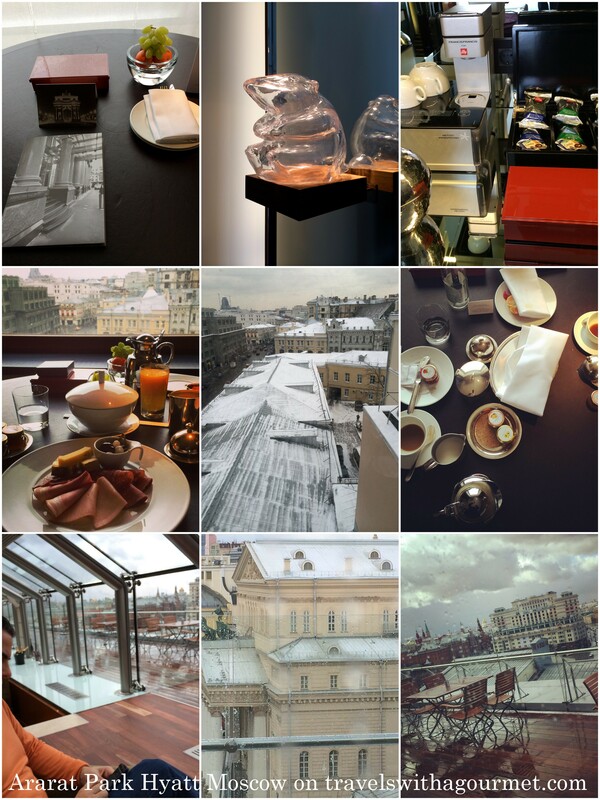 Room service was impeccable and the set-up was impressive – from the heavy silver tray to the crisp white linen, eating at the Park Hyatt was a pleasure and a great way to re-experience Moscow, my old home.